Don’t be fooled. Re-branding is not easy. Re-branding is quite an uphill task. Generally the emotions of re-branding include Anxiety, Excitement, Curiosity, Creative flow of thoughts etc. Well, it is a creative journey, the competitions and the friends come as a great influence and you tend to listen to all of them and hence making the entire task difficult. Since we have worked on few re-branding assignments, we thought to share ‘things which one should not do when they re-brand’. These are significant and also save time & effort. This is post 5 in the series. 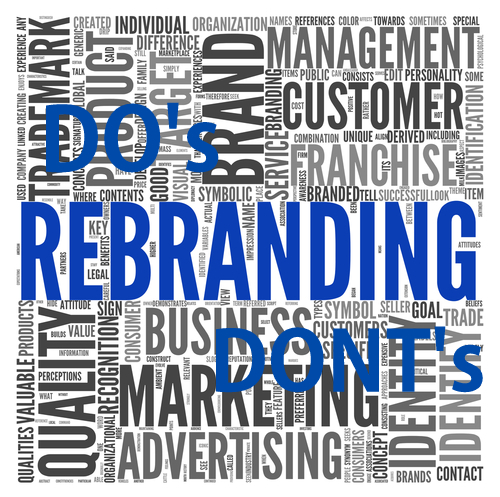 You have one or may be few reasons which made you choose to Re-brand. And you should work on those reasons and stop over thinking. It ruins the very idea and leaves not only you but the identity confused too. Many times people presume that changing the logo and the collaterals is enough to symbolize re-branding. Change the notion; remember a Branding includes all the spaces your brand touches. Changing the mere designs doesn’t signify re-branding. You need to change the brand environment – offline and online. If you are touching the brand colors – let that reflect in the office premise, the social networks, the employee uniforms and what not. Remember, Branding is not about logo & stationary design. Re-branding requires proper planning & research. You need to be sure about the reason for rebrand, you need to check the market, the competition, the name – if it pre-exists and in which category, is it a commonly searched brand name in what category and in which context. It has to be a well researched and assessed decision, before we launch a re-branding campaign. I have met people who want to go for a re-brand because their most important client suggested it, their spouse doesn’t appreciates the colors used, sometimes even because the astrologer indicated that it has got a wrong sign. That much of reasoning shall not result in re-brand and neither should a re-brand be decided on just the above stated logics. The groundwork needs to be done; the story has to be planned and there has to have interesting facts behind the brand. Neither just a design, nor your favorite color and not even just a random story individually are enough for re-branding. Sometimes, people go a lot after the premium brand. They want everything on the top of sky where as the Brand doesn’t needs it! As a result, the customers fail to relate, sometimes the design is so over done that the average performance or behavior of the brand is seemed as a failure or under performance. If you leave the basics aside and go on to create extravagant brand identity – remember that is not a promise of success. Though a Brand is your dream, your idea, your property but the sole purpose of its existence is not you. It is the customer for whom you create the brand and that is why you cannot ignore the customer. They should be kept in the centre of branding process – because they are ones who should be able to relate to the brand instantly. We have always maintained, stakeholders – internal or external know the brand, talk about it, listen about it, deal with it and that is the reason they should not be ignored during the process of re-branding. They know where the brand lacked, what were the areas of improvement and where the competition overlapped your brand and that is why they should he heard & made to participate in the re-branding process. Remember, Re-branding cannot happen over a cup of coffee – you need to drink a lot of them.